With a richer set of features and far fewer operational hurdles than its predecessor, the Sub 37 is superb. Can be used in duo-paraphonic mode. Syncable Arpeggiator and Step Sequencer. Two assignable (source/destination) modulation busses. Not much, given the price. 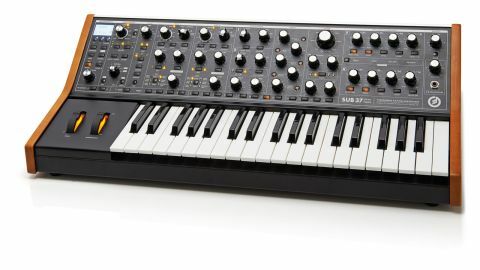 Little more than a year since the arrival of the 25 key Sub Phatty, Moog has released its successor, the Sub 37. It's bigger, meatier and easier to pilot - the Sub 37 user gets (for a nominally hiked price) a keyboard poised to be the most exciting member of the Phatty line. The Sub 37 looks markedly different to its predecessor. There are more keys, more knobs and more switches. Once you've removed it from the box, you quickly get the sense that you're in for a different ride entirely. The hallmark Moog wood panelling is employed on either side of the synth, with the left cheek being the location of all the unit's patch points (Power, Audio In/Out, MIDI, Pitch/Filter/Volume CV, KB Gate, and USB). The sturdy chassis is a steel/ aluminium combo and the 37 keys that give the synth its name feature both aftertouch and velocity sensitivity. Since we're on the subject of keys, we might as well tackle the subject of the keyboard's Duo Mode or paraphonic capabilities. This means the Sub 37 can play two independent pitches (one from Oscillator 1 and the other from Oscillator 2), both of which are then sent through the much-desired Moog 20Hz-20kHz ladder filter. This differs from a polyphonic synth in that polyphonic is defined as being able to play 'more' than two notes at a time. Switching between the Duo Mode and the monophonic side of the synth's personality is achieved by simply mashing the Duo Mode switch in the Oscillator section. Sound sources include the two aforementioned oscillators, a square wave sub oscillator, a pink noise generator, along with an external source control that doubles as a way to feedback the mixer output into itself to fatten up the sound (a la legendary Minimoog of the '70s). While busier than the Sub Phatty, the rest of the Sub 37 follows the Moog tradition of laying out its operational panel in a simple, logical fashion. To the extreme left is a small (1.5x1in) but welcome LCD display that heads up the synth's Programming Section. You can use this to manage any of the 256 presets (16 banks of 16 patches), of which the unit ships with 134 designed at the factory. You can browse presets by type (bass, leads, etc) and you can use the Compare button to contrast any tweaks you have made to a patch to an existing preset. With Compare lit, the preset is locked and can't be altered until you again press Compare and exit that mode. Similarly, you can move from Preset into a Panel Active mode when you want to strike out with a patch of your own creation. Presets for any bank can also be accessed quickly via the 16 preset buttons available just above the keyboard. If there was a hallelujah moment attached to the announcement of the Sub 37 it might have been the news that Moog decided to add a full-on arpeggiator to their newest creation (something not even included on the flagship Minimoog Voyager XL). Included in this section are a rate knob (conveniently labelled in bpms) and a companion Tap button in order to have the synth fall in line with whatever tempo the user desires. The arpeggiator will run -2/+2 octaves but if you double tap either of the up and down octave range buttons you will move into a mode where the arpeggiator "will play all the notes in the original octave, the second octave, the third octave" before heading back down in the opposite direction. Patterns available include Up, Down, Order (notes are triggered in the order they were played), and Random. Arpeggios can be latched so as to be played continuously without holding down any keys, and the Back/ Forth and Invert buttons add additional pattern variation. "A big plus that the Sub 37 brings to the table is two modulation busses, both of which have a wide range of routing destinations"
The Sub 37 also includes a 64-step sequencer. Creating sequences is largely a doddle and while in the Duo Mode, the sequencer will actually allow you to enter two separate pitches per step, which presents the user with some interesting pattern options. If for some reason 64 steps aren't enough, each preset can be stored with its own sequence, thereby offering the possibility of recalling different patterns that use the same sound. The Glide Section is similar to that of the Moog Minitaur, where the portamento effect can either be based on the interval between notes (LCR), a fixed time as set by the position of the Time knob (LCT), or an exponential rate of fast to slow (EXP). The effect can be assigned to either oscillator or both, with CV keyboard gating and legato added via the specified switches. A big plus that the Sub 37 brings to the table is two modulation busses, both of which have a wide range of routing destinations. Five waveforms (triangle, square, sawtooth, ramp, plus sample and hold) are on offer as well as a sixth position for the filter envelope or a controller option. A Hi Range switch in either of the Mod Sections lets you add frequencies in the audio range to the Sub 37's LFO, while a bipolar +/-5 Pitch Amount knob can be directed at either or both oscillators. A similar +/-5 knob is available to determine the amount of deviation added to the filter's cutoff frequency. The Mod Dest switch can take aim at up to seven destinations including one or both of the oscillator waveshapes, the rate of the other LFO, VCA, the noise level, or EG time. But you can also expand the range of either buss destination by hitting the Controller's switch and deciding how much impact the use of velocity, aftertouch, or the modulation wheel have on the modulation. You can even use MIDI CC external to the Sub 37 to tweak modulation depth. The mind boggles at the possibilities. With the Sub 37 being built upon its predecessor's sound engine (down to the inclusion of the Sub Phatty's lauded MultiDrive saturation circuit) and also inheriting its DAHDSR envelope functionality (see Outside The Box), what principally distinguishes the newer synth is its ease of use and flexibility. Moog did well to liberate all the 'under the hood' functions to the front panel and then expand the instrument's key range. And while you might not be inclined towardsa monosynth, the Sub 37's Duo Mode is an intriguing addition to the onboard sonics as opposed to a gimmicky substitute for polyphony. Tack on the arpeggiator and the sequencer and you have a very useful and roadworthy piece of kit that's bound to see you through years of creativity. Interested? Well, don't sleep on the Sub 37 for too long. Moog apparently has it set to be a limited edition, and this may be one of the best keyboards currently available at this price. You have been warned.